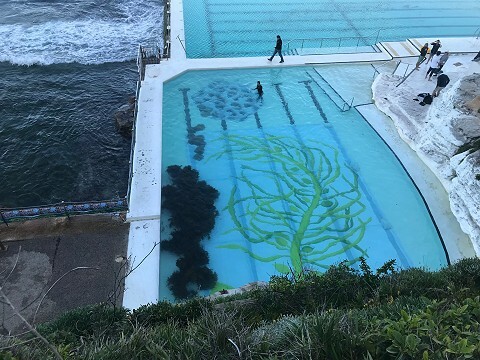 An image of a giant crayweed plant was seen last weekend (12-14 April) at the bottom of the Bondi Icebergs Pool for the Ocean Lovers Festival. Studio TCS worked with SIMS (Sydney Institute of Marine Sciences) to help showcase their two marine restoration projects, Operation Crayweed and Living Seawalls. Ocean Lovers Festival is a showcase of solutions to ocean recovery, cool products, projects and ideas for everyone and everyday living as an Ocean Lover. Conservation was the driving theme – showcasing global alliances as well as local best practice. Speakers and participants included Kerryn Phelps and Valerie Taylor, pictured below in the centre, with Jennifer Turpin of Studio TCS at the far right. 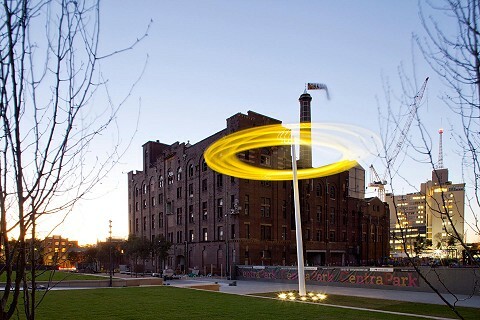 We're pleased to have our work, Halo, featured in this article in the Sydney Morning Herald, alongside examples of excellent environmental design. In other news, we recently had the privilege of working on the early stages of strategic public art planning for the Gosford Leagues Club Field transformation. We worked closely with Turf Design, the Darkingjung Aboriginal Land Council and the project team to contribute to the planning of a nature-inspired space with water play and sensory experiences for all ages, with Indigenous culture embedded throughout the park. 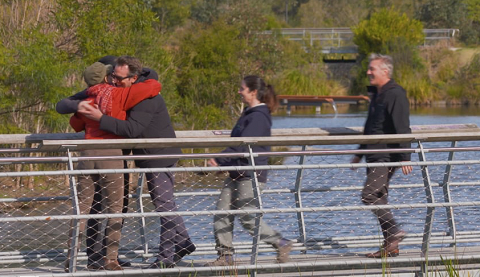 Our collaborative work at Sydney Park Water Reuse Project was recently featured on Channel 10's Australia by Design: Innovations. Please click here to view our excerpt. Also this year, Jennifer Turpin gave the 2018 Tom Bass Memorial Address, which can be found here. Seasons Greetings from the Studio TCS Team! We reopen on Monday 14 January 2019. Michaelie Crawford was an invited speaker at NAVA's Public Art Roundtable in November. Michaelie's presentation focused on the need for better training and education options for artists and curators wishing to work in the public domain. 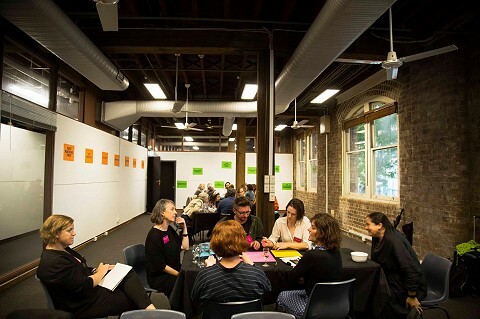 A diverse group of artists, industry leaders, architects, developers, consultants, agents and government colleagues at all levels participated in the three-hour workshop, which informs NAVA’s revision of the Code of Practice for the Professional Australian Visual Arts, Craft and Design Sector. This is the first of a series of consultations to be held across Australia, with the second in Melbourne next week on Monday 19 November. Studio TCS welcomes these discussions and looks forward to working closely with colleagues and with NAVA to contribute to the forthcoming updated Code of Practice. NAVA's press release can be found here. 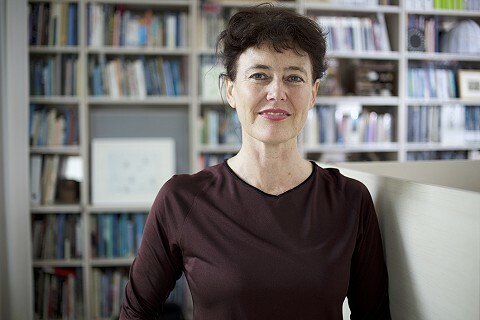 The 2018 Tom Bass Memorial Address will be given by Jennifer Turpin on the 31 October, at 7pm in the Centenary Auditorium at the Art Gallery of New South Wales. Jenny studied with Tom Bass in the 1980s and will present her work, and the work she has produced together with Michaelie Crawford over the past 20 years, in a presentation titled 'Collaborations with Nature'. In advance of this talk, Jenny gave an interview to the ABC, which can be found at this link. 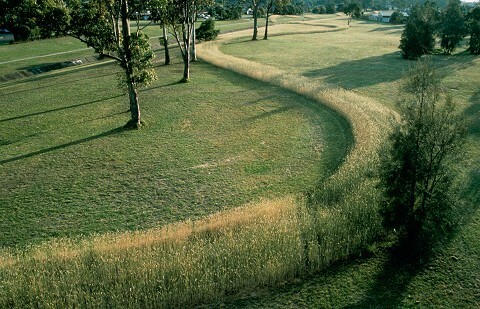 Sydney Park Stormwater Reuse Project awarded again! We're excited to announce that the Sydney Park Stormwater Reuse Project has been awarded another prestigious prize - this time the International Architecture Award for Parks, 2018. 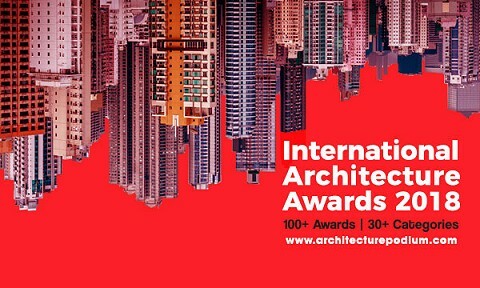 More details are here - International Architecture Awards 2018. Congratulations to all of our collaborators - Turf Design Studio, Environmental Partnership, Alluvium and Dragonfly Environmental - and many thanks to the City of Sydney. A number of Studio TCS projects have been included on the Government Architects Office website, including Restoring the Waters case study and the Sydney Park Water Reuse Project case study. These case studies, among others, support the release of the first state-wide green infrastructure policy drafted for NSW, the Greener Places report, authored by the Government Architect NSW. This policy argues that green spaces should be understood, developed and managed as a networked piece of infrastructure, rather than as a collection of discrete objects. For more information, please click Greener Places policy and Green Infrastructure policy. Turpin + Crawford Studio collaborated with Turf Design Studio, Environmental Partnership, Alluvium and Dragonfly Environmental, on the Sydney Park Water Re-use Project. The project has been awarded Europe's oldest award for the built environment, the Civic Trust Awards, which aim to "encourage the very best architecture in the built environment" and to "reward projects that offer a positive cultural, social, economic or environmental benefit to their local communities". The project is among 60 projects shortlisted from 234 submissions, of which only 11 were submitted from outside the United Kingdom. Turpin + Crawford Studio's work for this project, Water Falls, is an integrated sculpture built from terracotta troughs that respond to the site's history and act as a functional component of the stormwater filtration system, carrying water and creating habitat for wildlife. 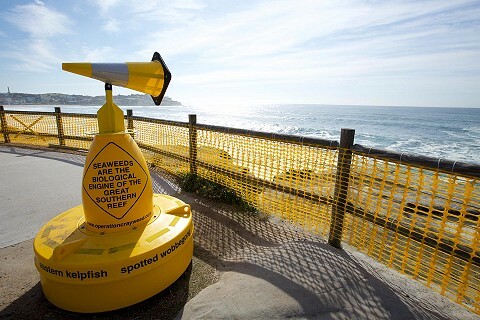 Last year’s Operation Crayweed Art-Work-Site, an art-science collaboration for Sculpture by the Sea, aimed to ‘reverse local extinction’ and bring Crayweed underwater seaweed forests back to Bondi, where they once flourished. Despite a severe storm that damaged the Crayweed planted on the southern side of the bay, the scientists didn’t give up. They repeated the restoration in the less exposed northern side of the bay and this second restoration has been successful - the adult Crayweeds have reproduced and there are now dozens of ‘Craybies’ growing on the rocks surrounding the transplant mats. We hope these will be the first generation of a self-sustaining new population of Crayweed that will continue to expand. The Bondi restoration is being followed up with other underwater reforestation efforts elsewhere in Sydney, including new forests being planted in South Head, Coogee and Maroubra in the south and Whale Beach, Warriewood and Freshwater in the north. Operation Crayweed Art-Work-Site was part of Sculpture by the Sea 2016. The art project played an important role in bringing this environmental marine restoration to the attention of all the visitors along the coastal work. Artists Jennifer Turpin and Michaelie Crawford involved hundreds of local school children in the project making wearable artwork, paraded along the coastal walk where their 500 metre long vibrant yellow land artwork marked the underwater rehabilitation worksite. Operation Crayweed Art Work Site is an ongoing collaboration between the artists and Marine Ecologist Dr Adriana Verges and the Operation Crayweed team from UNSW and SIMS (Sydney Institute of Marine Sciences). It is a creative environmental project of renewal bringing together art, science and the community. 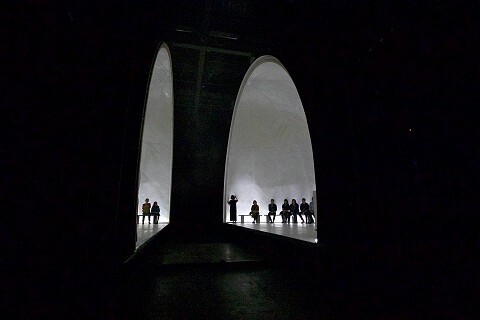 From 22 June 22 to 2 July 2017, a new iteration of the work Nomanslanding was presented in Glasgow, at the Tramway, as part of the 2017 Refugee Festival Scotland. The work is an international co-commission between Glasgow Life and the Merchant City Festival, the Sydney Harbour Foreshore Authority and Urbane Kunst Ruhr in Germany, and brings together five artists from three countries (including Jennifer Turpin, Nigel Helyer AKA Dr Sonique, Robyn Backen, Graham Eatough and Andre Dekker). 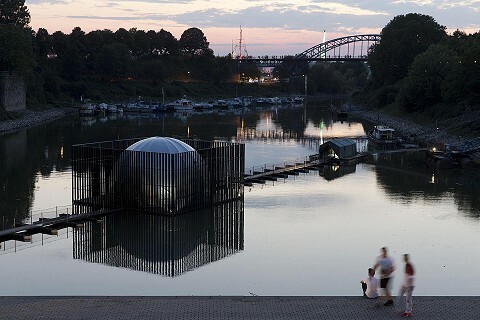 Nomanslanding was originally presented in Darling Harbour in Sydney and in Duisborg Ruhrort in Germany in 2015. On 6 May 2017, the East Sydney Community and Arts Centre in Darlinghurst (formerly known as Heffron Hall) was opened by the Lord Mayor, Clover Moore. Our work, S(w)ing, is activated by children playing on the lower level of the centre, who set the artwork in motion by pulling on coloured ropes. 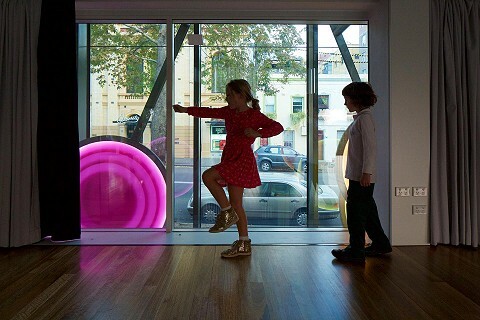 S(w)ing is an artwork at play, a joyous choreography of colour, light and movement. The East Sydney Community and Arts Centre is a multipurpose space that features spaces for rehearsals, creative use and community hire. Congratulations also to Lahznimmo Architects and Spackman Mossop Michaels Landscape Architects! Jennifer was awarded a Churchill Fellowship by the Winston Churchill Memorial Trust. 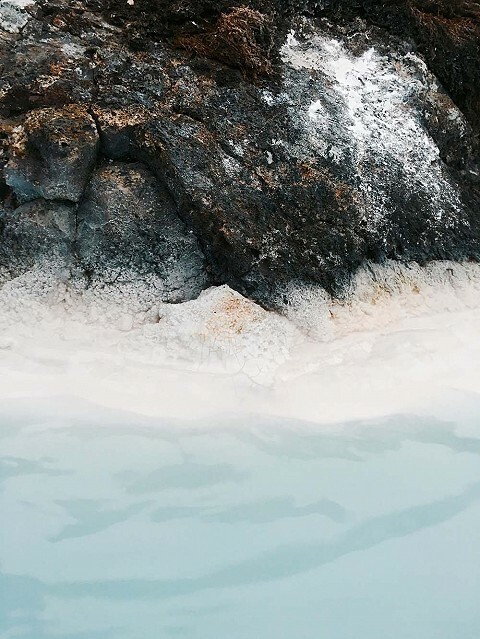 In 2016, she travelled to Japan, Iceland, Denmark and Italy to study environmental artworks, and cultural uses of water, both contemporary and traditional. The November edition of Landscape Architecture Australia acknowledges Turpin + Crawford Studio's work, Storm Waters, at Joynton Park in Zetland, in the Significant Projects 2001-2016 section. Operation Crayweed Art-Work-Site was a multi-faceted, environmental performative and participatory art and science project that celebrated a significant and far-reaching good news story for Sydney’s coastal marine biodiversity. 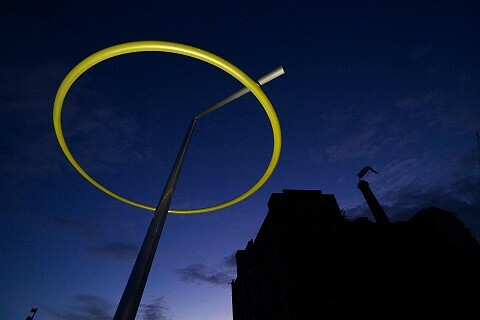 An ‘art-work-site’ was established along Sydney’s Bondi to Bronte walk as part of the 2016 edition of Sculpture by the Sea. It physically and conceptually highlighted the otherwise invisible underwater crayweed reforestation project ‘Operation Crayweed’ being carried out along the Sydney coast including in the bay between Marks Park and the South Bondi Headland. The project was a collaboration between artists Jennifer Turpin and Michaelie Crawford of Turpin + Crawford Studio and marine scientists from the Sydney Institute of Marine Science and UNSW. Created by five international artists (Robyn Backen, Andre Dekker, Graham Eatough, Nigel Helyer and Jennifer Turpin) and initiated by Sydney Harbour Foreshore Authority, Nomanslanding premiered in Darling Harbour, Sydney this April, is now showing at the Ruhrtrienniale in Germany and will next year travel to the Merchant City Festival at the Tramway in Glasgow. No Man’s Land refers to the impasse, the place no one dares traverse, the gap of fear and uncertainty between two sides of tentative safety – a memory, a metaphor inherited from the impossible stand-off of World War I trench warfare. How can this empty space, this vacuum of devastation be poetically reimagined? Traverse the pontoon bridges and step into a surround-sound installation and performance while floating in the middle of the water. There you will be taken on a poetic journey of a soldier’s experience during wartime: confrontation and conflict, hope and redemption. Time slows and life speeds past. 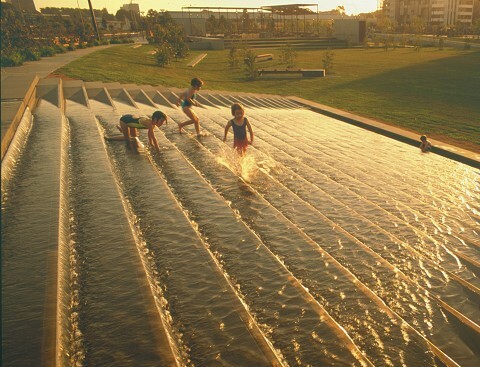 We are proud to announce that the Sydney Park Water Re-Use Project, of which our work Water Falls is part, has been announced a winner of the 2016 American Architecture Prize, in the category of Landscape Architecture. More details of the prize and other winners can be found here. A wonderful article about this work, written by Ricky Ricardo, was also published in May.